The German Council of Science and Humanities (“Wissenschaftsrat”, WR) gave Jena’s Leibniz Center for Photonics in Infection Research (LPI) a very positive evaluation. The corresponding “Report on the Science-Led Evaluation of Comprehensive Research Infrastructure Projects for the National Roadmap” was published on Monday, July 17, 2017. A user-open center could form in 2018 to research photonic solutions for the diagnosis, monitoring, and experimental treatment of infections and develop functional solutions in collaboration with industrial partners. In its evaluation, the WR praised the unique photonic approach, which could lead to a global improvement in diagnostics and treatment, especially of multi-resistant pathogens. The Leibniz Institute of Photonic Technology Jena e.V. (Leibniz IPHT), the Leibniz Institute for Natural Product Research and Infection Biology – Hans Knöll Institute (Leibniz HKI), Jena University Hospital, and the Friedrich Schiller University of Jena under the auspices of the Leibniz Association jointly applied for the LPI. Unique, brilliant, revolutionary, and groundbreaking – these were the words the German Council of Science and Humanities (WR) used to describe the “Leibniz Center for Photonics in Infection Research” (LPI) initiative in Jena. LPI is one of eleven project ideas for comprehenisve research infrastructure reviewed and comparatively assessed by the WR upon request of the Federal Ministry of Education and Research (BMBF). The evaluation process served as the BMBF’s basis for the decision on admission into the National Roadmap, the federal program for large-scale research projects in the coming legislature period. 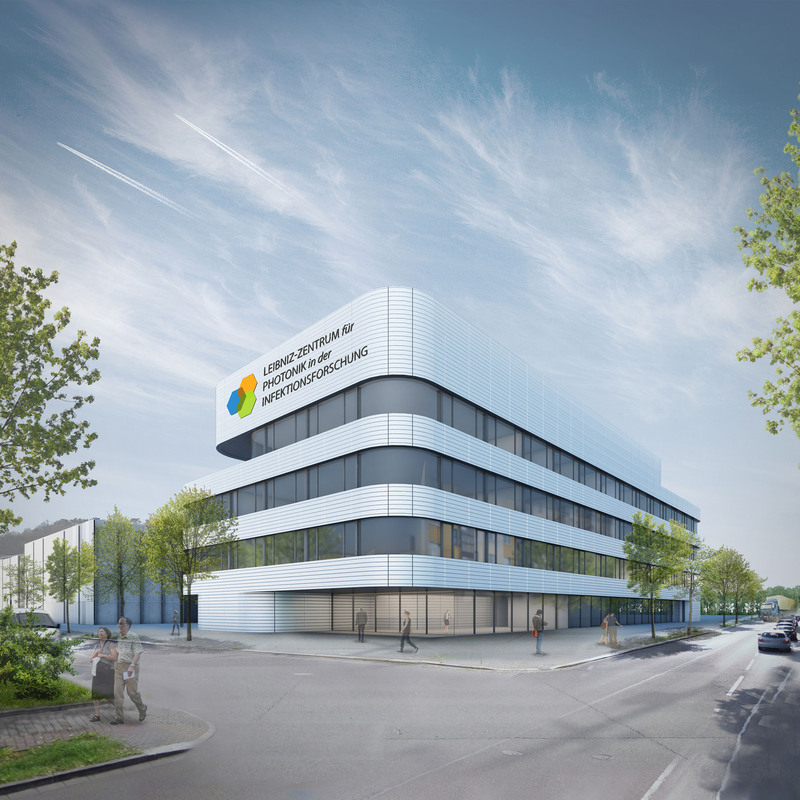 This joint research project will commence in a new building on the Jena University Hospital campus. “This will allow us to take real patient samples under highly standardized conditions, analyze them, and work with them,” said Michael Bauer, director of the Department of Anaesthesiology and Intensive Care at Jena University Hospital. According to the WR, solutions in the targeted problem areas are of “enormous social importance.” An economically positive effect can be exected for Germany as well. In opinion of the WR, LPI serves a very broad user circle in science with this cross-disciplinary approach. There is also a very large economic interest to this approach. As a platform that is generally open to all users, the Leibniz Center oversees access via a peer review process that evaluates the scientific excellence of the suggested projects. According to the assessment of the WR, LPI’s unique merger of photonics and infectiology helps Germany gain significant international visibility and appeal as a center for research. In particular, LPI promotes young research scientists through the “Medical Photonics” master’s program and other doctoral programs. LPI is also an attractive environment for established research scientists and clinical personnel. For Thuringia and the metropolitan region of Central Germany, infrastructure measures could mean significant developmental growth. The fundamental idea behind LPI is the maximum bundling of knowledge, experience, and expertise from different disciplines: at the center, the cross-disciplinary competences of the Leibniz Association and the know-how that has been available in Jena for years in the fields of photonics and infectiology merge. Concretely speaking, LPI combines under one roof the research approaches of the Leibniz research alliances “Leibniz Health Technologies” and “Infections21” with those of the InfectoGnostics research campus in Jena, a public-private partnership that has already been able to introduce products onto the market successfully for infection diagnosctics. The experience gained as part of “InfectControl2020” also plays a role. This is a federal BMBF project coordinated in Jena for all the eastern German states. LPI will be implemented in three phases: After the preparatory phase (2016-2018) , which is currently running, the implementation phase (2019-2023) will begin, followed by a final operational phase on use and stabilization (2024-2033). A final decision and the publication of the National Roadmap by the BMBF can be expected at the beginning of 2018.